Combine ginger, garlic, soy sauce maple syrup and mirin in a bowl and then toss the salmon to cover it completely. Cover the bowl with cling wrap and allow to marinate in the fridge for 20 mins. Meanwhile, cook the brown rice per the packet instructions. Slice the cucumber into 3cm sticks. Cut the ½ avocado in half long ways and then dip into the sesame seeds to cover one side. On pre-heated fry-pan cook salmon on a medium heat for 3-4 mins before turning the salmon over and cook for a further 3-4 mins. Be careful as the marinate burns easily. Remove the salmon from the pan and allow to rest while assembling the bowls. 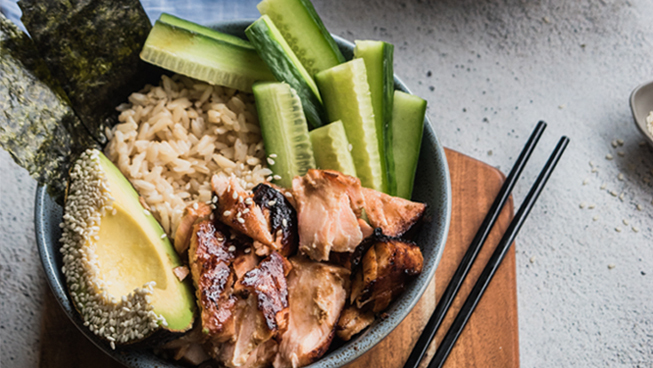 Place ½ cup of brown rice into each of bases of the bowls, then place cucumber to one side, avocado quarter on top and then flake one salmon fillet onto the bowl. Finally break one nori sheet and place two small pieces in the side of the bowl. Serve with sweet chilli sauce and enjoy!